There is currently just the 1 ferry route running between Mallorca and Formentera operated by 1 ferry company – Balearia. The Palma to Formentera ferry crossing operates weekly with a scheduled sailing duration from about 3 hours 29 minutes. Whilst we’ve taken great care to ensure the information on this page is correct, as the frequency and duration of crossings on all routes can vary from time to time we’d advise that you get a live quote for current availability on this Mallorca Formentera crossing between Palma and Formentera. 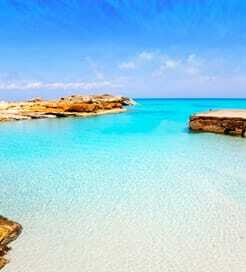 Formentera is the smallest and quietest of the four main Balearic Islands (Ibiza, Menorca and Mallorca), off the east coast of Spain, about 6km south of Ibiza. With its white sandy beaches and turquoise waters, Formentera is beach lover’s paradise. The climate is typically Mediterranean which means it’s a popular tourist destination between June and September, though less busy and a more relaxed than neighbouring Ibiza. With no commercial airport on the island, the only way to Formentera is by ferry, either from Ibiza or mainland Spain. Ibiza is close by and provides year round crossings to La Savina port in the north of Formentera. In peak season, crossings are as frequent as every 30 minutes and are operated by both Balearia and Trasmapi. If you're travelling from mainland Spain to Formentera, then the best option is to take the direct route from Denia. The crossing is relatively short at around 3 hours and runs between April and September. 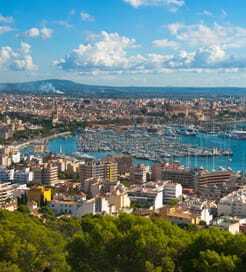 The alternative option is to travel from the mainland to Ibiza from Barcelona, Valencia or Denia and then pick of the inter-island connection between Ibiza and Formentera.